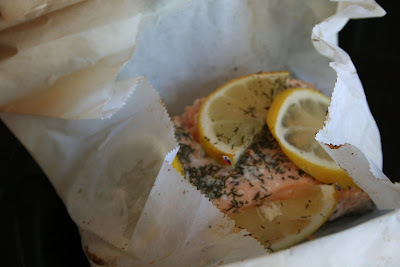 Naked Cupcakes: Lemon Dill Salmon - baked in parchment! Lemon Dill Salmon - baked in parchment! The other night a girlfriend (who just got engaged recently! woohoo!) and I had a hot tub evening to catch up and we decided to do dinner as well. I grabbed some salmon on my way through the grocery store and had no clue what I was going to do with it until I got home. 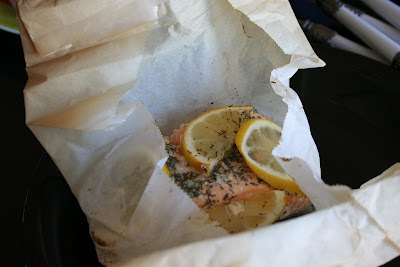 I had seen a couple recipes online that had baked salmon in parchment in order to keep it moist, and I thought that would be perfect because then I could top the salmon with some fresh lemon slices and not have to worry about them charring under the broiler. I placed each piece of salmon on a piece of parchment and then topped them with some salt and pepper, dill, and fresh slices of lemon. I then wrapped it all up into a little package, baked them for 20 minutes at 425 F (my oven is running excessively hot lately, so 450 F would probably be perfect in a normal oven) and out came delicious and perfectly moist salmon! So for this meal, the original recipe is from me! Since we were so busy visiting, I only got the two pictures of our main dish before we gobbled it up. Red and White Cupcakes - Happy Canada Day!